After one introduction show, five elimination shows resulting in eight acts crashing out and one illness shattering the hopes of one unlucky hopeful, we’re finally nearing the finishing line of Lithuania’s national selection marathon Eurovizijos atranka 2015, starting with tonight’s first of two national finals. Just like the acts, 12 songs started their Eurovizijos journey way back when. Several weeks and nine eliminations later, only three songs remain in contention, “Dangerous (S.O.S. )”, “The Right Way” and “This Time”. All three artists performed their own versions of the three songs. 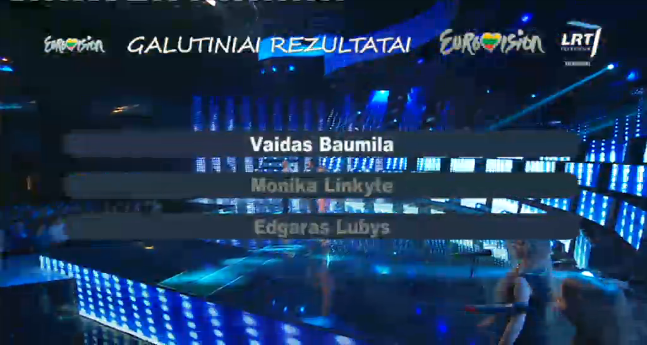 As usual, the Lithuanian jury panel assesed each song, but not the artists themselves. 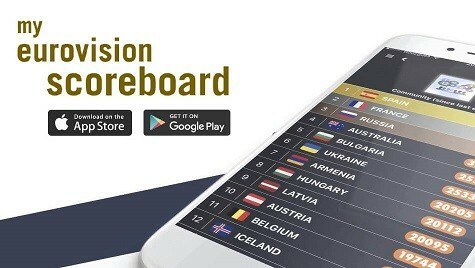 They were then combined with the points of the international jury and televotes. And we can now confirm that “This Time” will be performed in Vienna this year. “The Right Way” finished in second place and “Dangerous” came third. Although the three finalists themselves weren’t assessed tonight, it seems that everyone agreed that Vaidas’ version of “This Time” was the best. Our readers also agree in our poll. And no, you’re not seeing things. LRT have accidentally put Edgaras Lubys in place of Mia at third. Oops. Next week’s national final is the big one, as the three finalists will be compete against each other in a winner-takes-all showdown to see who will represent Lithuania with “This Time” in Vienna this year. Who do you want to sing “This Time” in Vienna? YOU CAN FOLLOW ALL OF OUR LITHUANIA EUROVISION NEWS HERE. By the way, wiwibloggs – andrius pojavis has a new single, “Summertime Lights,” and it’s pretty cool. @Paul: LOL. I would love to have seen Uzari and Maimuna sing Accent. That would’ve been funny. Mia is so stunningly beautiful, yet the songs that she has been given to sing are not. A more typical format with the song married to the singer would have been more in her favor. I fear that this will be her last chance next week and that she will not be seen or heard from internationally again. I definitely think Mia’s performance was the best for “Dangerous,” but I’m not a fan of singing one verse, then the chorus, then going back to the one verse. It feels like only half a song. I fell in love with “This Time” right away, though it was the demo posted at eurovision.tv. I think a duet would be lovely; the final presentation was the best from the whole show. YES!!!! Now they’ve just got to send Vaidas! Vadais AND Monika, what else ? We are really happy that “This Time” is the winner song! It has huge potential especially if Vaidas & Monika will sing together. We believe that this year we have great chances with this song and these artists. This time with Vaidas very good! Some wrote Vaidas and Monika sung Dangerous bad on purpose for This time. I think it´s not therfor. I think cause the song too bad. Should not been in final if they not poll for it at internet the whole nights! It is what I think! I actually prefer Vaidas alone, but I can accept a duet. As long as Vaidas goes, I am happy. Maybe it will even my new first then. If they only send one singer, then it should be Vaidas. But I prefer the duet with him and Monika, but I don’t see how they will be able to send that since the three singers are competing againdt each other. There it is! What a great selection for Lithuania. SO HAPPY with this! it’s gotta be Vaidas seriously, if one of the two girls will go to Vienna with this they won’t get in the finals.